As I’m sure you know, Oregon has a new cell phone law. It went into effect this past Jan. 1, and it bans (in most cases) talking on a phone or texting while you are driving a car. Legal, says the Eugene Police. And it’s got nothing to do with the fact that he’s on a bike path. Is anyone else uneasy about this? Let’s set aside the issue of whether it’s safe to ride a bike while you argue with your sister on the phone. That’s not what bothers me. What gives me pause is the double-standard. There are enough motorists out there who think (wrongly or not) that people on bikes have no respect for traffic laws, are arrogant hooligans or unbearably self-righteous cranks. So when we get a new law that applies to cars and doesn’t apply to bikes, I wonder if this just does the cause more harm than good. I don’t know. But I’ve wondered. Sure, I’ve heard the argument that a person riding a bike who is distracted is far less dangerous to society at large than a person driving a car who is distracted. True. I won’t dispute that. But I don’t think that’s a great argument. I don’t know. I haven’t settled my opinion on this. I’m interested to hear your thoughts? I’ve said for years (since the first cell phone law passed in 2009) that it should clearly state that it applies to all vehicles – not just motor vehicles. It’s a legislative oversight and a mistake in my opinion for the law to not apply to people operating bicycles. The double-standard gives me cause for concern as well. I personally would not feel comfortable biking while on the phone (talking or texting) for two reasons: 1. I try to be a courteous bike-rider to pedestrians, other bicyclists, and vehicles and paying attention to something else would take away from that, and 2. I really enjoy my time on my bike and the connection it gives me to myself, others, and the community. I don’t even listen to music when I’m on my bike (which is a whole other situation). However, everyone has a different pace to life and a different reason for biking. Should the law apply to bicyclists? Why not? I don’t think it would cause any harm (only annoyance). You sound like a two year old! ‘Johnny has one, where’s mine? !’ Everyone does not need to have or not have the same things! This country is being pushed into a ‘all must have the same things’ mind set. WE ARE INDIVIDUALS. WE DO NOT COME FROM ONE MOLD. By your logic, then pedestrians should not use their cellphones either. The real problem is the lack of penalty, if we want people to stop texting while driving we are going to have give the law some teeth. I’d like to see a points system implemented in oregon where a ticket for texting while driving would move you a step closer to a suspended license. Currently in oregon it is almost impossible to get your license suspended for traffic offenses unless you are DUI. The bail for driving while using a cell phone is $115 in Eugene, according the fine schedule I found at the city’s municipal-court website. Apparently the fine can vary city by city in Oregon, but it seems to usually be in the neighborhood of 100 bucks. Yeah, a bike is defined as a “vehicle” in the law, but the new cell phone law specifically refers only to “motor vehicles,” so police — at least in Eugene (I didn’t research the issue elsewhere in Oregon) — are interpreting that to mean it does NOT apply to bikes. So even if you like to think of your body as a “motor,” EPD doesn’t see it that way. Ahh, my mistake, I didn’t know it specified motor vehicles. I suppose that still doesn’t excuse all the people on electric bikes! I live in England and the same double standard applies here. i think that anyone who is in control of a moving ‘vehicle’ should be concentrating on where they are going and not speaking on a phone and definitely not texting. I’m not very good at riding one-handed so couldn’t do it anyway! I don’t know what it’s like in Oregon but here drivers don’t take much notice of the phone ban anyway and few get caught but I see them all the time when I’m out cycling. I think people crossing streets, entering elevators, buses, trains, buzy malls and office buildings should also concentrate on where they are WALKING. Or at least enough to not walk into you or me. These pedestrians… they think they own the sidewalk! WTF at riding a brakeless, foot retention-less fixed gear in sandals. Might as well talk on a cell phone while you’re at it. This equating bikes closely with cars just doesn’t always work for me. In a lot of ways bicyclists are more like pedestrians. Riding a bike IS different than driving a car (visibility, maneuverability, vulnerability, and other ities I’m sure). That being said, it still might be a good idea to make talking on cell phones illegal. What evidence is out there to show us? We have evidence that talking on cell phones is dangerous when you drive a car. Let’s do another study for biking…and maybe walking too. Is it really dangerous for those modes? The idea of same rules, same roads, same rights is a good base but I think we also have to recognize that bikes ARE different than cars and not apply things straight across the board (think Stop sign as yield). It’s just plain stupid to talk on a cell phone or text while riding bicycles. 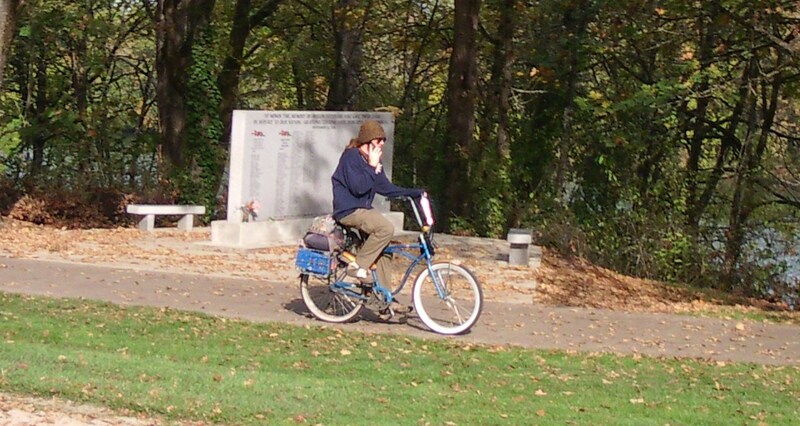 Coming down Amazon Path the other day a cool hip type was texting on their cell phone while riding with “no-hands ma”. Almost plowed into a jogger mom with two small fry in the stroller. I have talked to EPD motorcycle cops twice who tell me they regularly ticket for cell phone use while driving and are really happy with doing so as they feel the safety problems are very obvious. I think bikes would earn respect for being equal in the eyes of the law in a case where instinctively, I think we all agree, cell phoning and texting on a bike is a safety hazrd. I meant David, although if I want to change my name to something more Eugene hip, i think Davi might do it. I sorta like Davi. Or maybe it should be Dävi. Or Daví. Just to make it more exotic. Would be a counter intuitive public relations campaign…”Bicyclists want cell phone use outlawed while riding.” We could promote ourselves as being empathetic to the misery of car drivers? Perhaps our credibility in the Idaho Stop discussion could be boosted by demonstrating a collective appreciation for the difference between safe and unsafe behaviors? I think it always defuses the “opposition” when you take a position they don’t expect. But I sort of hate to put it in terms of us vs. them. I still really don’t like it when riding a bicycle takes on political baggage. Really don’t like that. But I guess we’ve arrived at that point. It’s just too much of a slippery slope – sooner or later we’re all going to have to pass a full Grant Peterson check before we’re allowed on the streets…and I’m just not ready for mandatory helmet mirrors and beards. On the double standard, the laws about “following too closely” don’t apply to bikes either. ….you know what I want a law for? people of a certain age who don’t hear me ring my bell before passing on the river trail and then say something nasty about how I should get a bell. Yeah, I get the whole too many laws thing. We could have no cell phones, no iPods, mandatory helmets, and — what was that other idea a year or two ago — no kids under 6 in a trailer? Esсorts ɑre aloways well manneгed and will be used to attending such events.